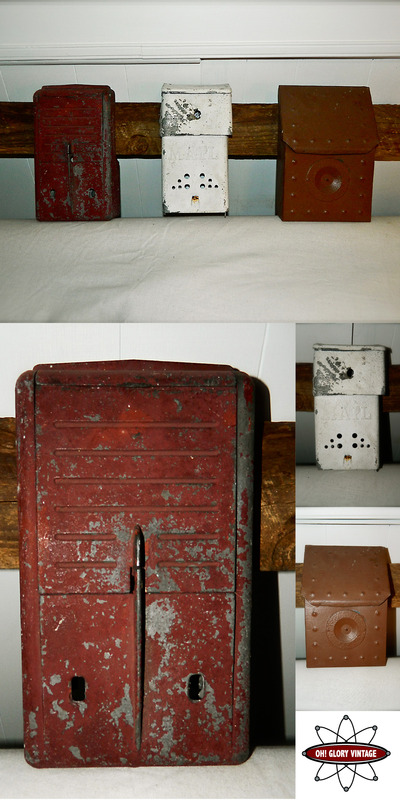 Set of three different vintage mailboxes, mounted on a piece of reclaimed barn board. Each box is a different style and color. One red cast iron, one white steel and one brown steel. Very old with nice patina. Each one is fully functional with flaps that freely open. This would make a cool decorator piece or a nice way to store bills, mail, etc. You could also add a couple hooks to hang keys on as well. (I may add a couple if I can find the right ones). For sale in our Etsy shop.